A worker who was pinned under a mower in Surrey was given CPR. A man is in a healthcare facility after being pinned under a riding mower. The incident occurred as the worker was cutting grass in Glenwood Park. Somehow, the city worker went into the pond and was caught underneath the mower. It is not clearly known how the man ended up trapped nor it is known how long he was submerged in the pond. According to one witness, the man’s coworker lifted the mower off him with the assistance of a bystander. They pulled the man from the water and performed CPR while waiting for emergency responders to arrive. The man was transported to a healthcare facility in critical condition. 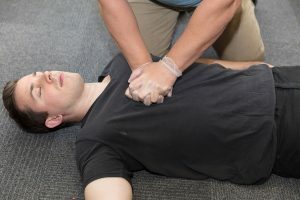 Cardiopulmonary resuscitation (CPR) is a life-saving technique that can save lives. It is vital during emergencies since it helps improve the chances of survival. Prompt delivery can mean a difference between life and death.